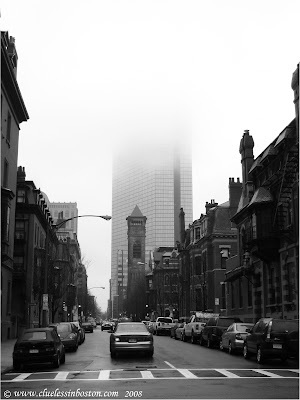 :) I love the black and white to begin with but that tower shrouded in mist is a beautiful addition. Have a great week-end. We have some drop dead gorgeous architecture here, don't we? Beautiful the way the fog shrouds the building. Definitely one that is suited to being in black and white too! Head in the clouds if you are on one of the higher floors. Nice photo of the fog and so good in black and white. -chuckle- Great photo and great title! !